English brown calf, inlaid panels, with gilt panel tooling, ca. 1700. Eighteenth century bookplate of John Campbell, 4th Earl of Loudoun; purchased by J. Pierpont Morgan (1837-1913) from Quaritch in 1900; J.P. Morgan (1867-1943). 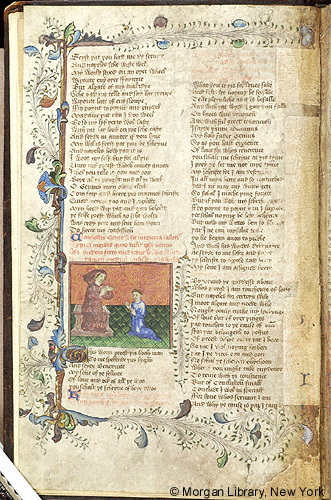 Ms. moralizing tales in verse; written and illuminated in England, 1425-1450. Decoration: 1 small miniature; floriated borders at the beginning of each book; numerous illuminated initials.